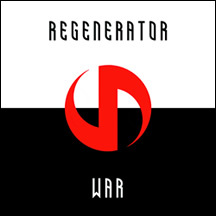 War is the latest offering from the American duo known as Regenerator. Blending elements of EBM, Electro and Pop, Regenerator has continued to evolve and experiment with every new release. After nearly two years in the making, War is by far the darkest and moodiest album they have released to date. From the catchy melodies of "Take Me" to the slamming beats of "War," Regenerator has prepared both the mind and body, spiritually and physically, for an all out assault. A true must have for those who are looking for an album with an emotionally charge or for those just looking for a reason to hit the dance floor.